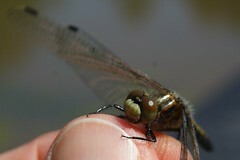 I finally did my first official Dragonfly Survey for 2007 today with the help of our college intern, Kim. This is year three of a 3-year study (which might be extended to 5 years) for the Natural Heritage Program. It was a sunny, breezy day with temps around 80F. I was rusty, and Kim was a beginner, so netting a few to photograph was comical at best. I forgot the field guides and paper & pencil, so we had to rely on memory and camera shots to reconstruct a datasheet when we got back to the office. My first catch puzzled me. It had a white face, though, so I was sure I could figure it out when I got the chance to look at the pictures. Turned out to be a female Dot-tailed Whiteface. I probably should have guessed that! We had a lot of Dot-tailed Whitefaces around these ponds last summer. Hey… I told you: I’m rusty! Many of the others I knew on the wing. But I netted them for practice: practice netting AND practice photographing. At my training a couple of years ago, we were trained to use a white magnetic dry erase board and to hold them down by the wings with magnets. Jeremy Martin had showed me a new way to hold them for photographing and I liked that way much better. I like the photos better, and I like that I can carry less equipment in the field. 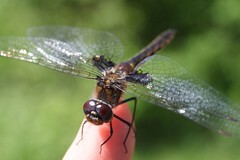 This little Baskettail was very cooperative. After several shots using the wing hold, and the leg hold, I got ready to let her go. She didn’t want to leave. She sat on my finger for quite some time allowing me to take several more shots of her. Finally, I was getting antsy to try to net another, so I set her on a bush on the other side of the trail. Eventually, she took off. I’m looking forward to searching for eggs from this species. They lay them in long strings – like miniature Toad eggs. 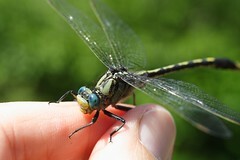 Many of the clubtail species tend to be found in river habitats. The Unicorn Clubtail likes muddy-bottomed ponds, however, so we regularly see them at Audubon; we have lots of muddy-bottomed ponds! Clubtails and Petaltails have eyes wide apart. All other families of dragons have eyes that touch. I didn’t get photos of the others that were flying. But here’s a list of the species Kim and I saw. There were a few damsels, too, but I’m not sure what they were. Earlier in the morning, when I had too many kids around me, there were loads and loads of spreadwing tenerals… I’m not sure what kind. 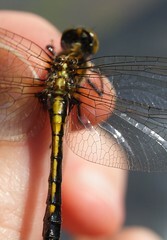 By the way, I netted a Twelve-spotted Skimmer male who was not at all cooperative. He thrashed around in the net and between his thrashing and my attempt to calm him, we managed to damage his wings. He also bit me 2 or 3 times. Anyone else have this kind of experience with Twelve-spotteds? Is it a species trait to be feisty? This entry was posted in dragonflies. Bookmark the permalink. Fantastic photos, and a reminder to visit a wildlife refuge soon. I was there last June and a grassy spot down by the water was teeming with damselflies, many of them a stunning iridescent blue. 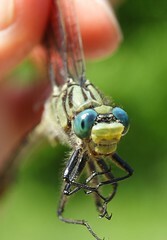 Do you have any posts of damselflies? Great job! The pictures are fantastic. We will have to get you looking at the damsels soon. They are much easier to photograph, and the bluets are so much fun to ID! I am surprised that you didn’t see a Widow Skimmer out; add that to the list and you could make a poster of the most frequent visitors to the Audubon. I’ll see you tomorrow at RTPI (I’ll be a little late though; I have an eye appointment at 8:45). Is this hold something that you need to be trained for-or can you tell us the secret of doing it? Larry: After you net them, you have to reach in and try to get the wings up over the back – hold all four wings together between finger and thumb. That’s the wing hold – I’m using it on the last photo above.